Before I became an academic, I worked for a consultancy company. As you may know, you bill your time (much like lawyers) by the hour. The main currency of work in consulting is your hourly rate and the number of hours you work. I didn’t really like that approach, but I ended up continuing as I wanted to gain experience in the consulting world. Later I got a job as a researcher at a research centre that behaved itself more like a consultancy. My boss, and the institution wanted BILLABLE HOURS. Look at the contradiction: a research centre, where you do R&D, asking you to put in BILLABLE HOURS, like a lawyer). So, we all worked really long hours. We worked insanely long hours, because time we spent reading, preparing lab materials, setting up analyses, writing up reports was considered NOT BILLABLE. The industry that this R&D centre served didn’t really want to pay what real R&D costs, so they only wanted to pay “what was fair”. Obviously, when a client is price-sensitive, you have two choices: either you find new markets (and new clients) or you go with the flow and accept the price point that the market sets (which is often very, very low). This is the case as well in many academic contexts, where tenure-track professors are paid much better than contingent faculty who are paid very low wages. While that discussion is extraordinarily important, it’s not the focus of this post. I’m referring right now to the attitude that when we read, or reflect, this is considered or perceived as though we are not working. Continuing with my anecdote, one of the services I offered that was very popular was analyzing chemical compounds and creating Material Safety Data Sheets (MSDS). Because clients were extremely price sensitive I charged the equivalent of, say $25 dollars per. This wasn’t the cost. My (arbitrarily assigned by the R&D centre) hourly rate was MUCH higher. So I had to work SUPER LONG HOURS to achieve the target number of billable hours. Basically, I had to under-sell myself and work long hours to ensure I could sell the service (writing an MSDS) to a price-sensitive buyer. I did this to keep my (then) bosses happy and be able to bill lots of hours, so that a “large percentage of my time (preferably, the majority) were billable“. But my thinking time, my reading-and-learning time wasn’t considered billable. The time I spent doing what I was supposed to be doing the best (thinking, learning, upgrading my skills) wasn’t “client-centred work time“. We can’t, we should not let this approach creep on to academia. The time we spend reading, thinking, mulling over, meditating IS IMPORTANT. If I’m reading in my office (or my cubicle, as I used to when I worked in consulting), I’M NOT RELAXING. I AM DOING MY JOB. aylorism in academia is stupid. Efficiency, understood that way, is stupid. That’s what we ought to fight. We. Produce. Ideas. 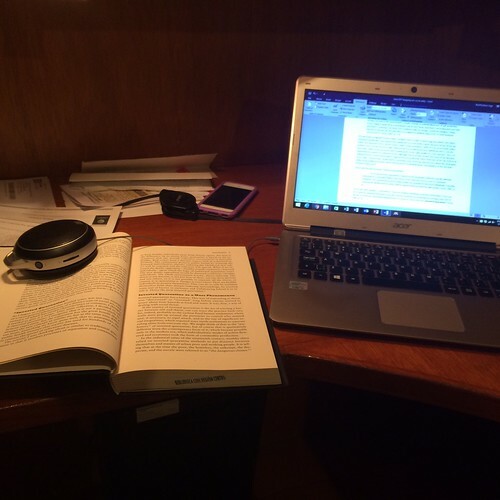 Academic work is not about the billable hours. It’s about being able to make an intellectual contribution and learn so we can teach what we learned. To be able to make this contribution we need to spend time reading, thinking, analyzing data, learning. That’s not wasted time. That’s INVESTED time. So, if you spent 3 hours reading an article, YOU DID NOT WASTE YOUR TIME. You are not billing hours. You are learning, reflecting. I’m a professor of public policy. Public policy requires you 2 make hard choices on which policies to implement under resource constraints. 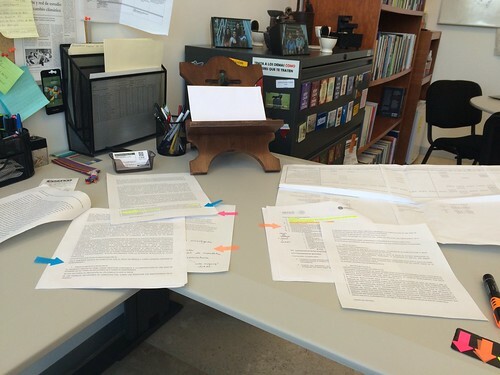 I KNOW the trade-off between “writing” generative writing and writing notes on the margins of papers as I read. I don’t take it lightly. I know that the time I am spending reading is time I am not answering emails, or grading, or preparing class, or meeting with my research team. But it’s time I NEED to spend on that specific activity: learning, engaging with the literature, reading, thinking. Analyzing data works the same way. To me, being able to spend the time to read and reflect and really craft an argument, understand the data, run a model, is VITAL. So the next time you book 30 minutes to read an article to catch up on the literature, don’t beat yourself up. THAT’S WORK TIME. I have spent entire mornings reading, and writing on the margins of the papers I read, and writing memorandums. All of that time, IS WORK TIME. One reason why I don’t want to come back to consulting is because of the billable hours. My roommate in grad school almost died. She was a lawyer. She slept (no word of a lie) 3.5 hours every night. THREE HOURS. Because she needed to keep a certain quota of B. H. She then had to go on medical leave for a very long time because she had neglected sleep for so long. I don’t want that life. EVER. I don’t think anyone should either. Tagged with academia, consulting, time management.